If you live in a part of the country where it snows during the winter, consider yourself blessed. Not everyone gets to experience the first snowfall of the season or the excitement of a snow day or knowing what it’s like to have a real, white Christmas.However, living in a snowy area isn’t all fun and games. Those that know better know the downsides of living in the coldest parts of the country, like dealing with icy wind and freezing temperatures, shoveling driveways, and clearing ice dams from the rooftops.Fortunately, most residents across the country don’t have to deal with snow-covered roads on top of everything else. Thanks to our city’s snow plow drivers, residents can enjoy the convenience and efficiency of clear roads throughout the season—even just after a major snowstorm. At 160 Driving Academy, we’d like to extend our greatest thanks and appreciation for the snow plow drivers of this country that work so hard to keep our streets cleared throughout the winter.Snowy winters are a reality in all of our locations across the United States—in Illinois, Missouri, Michigan, Indiana, Wisconsin, Texas, Ohio,Virginia, and New Jersey. Because our business lies in training students to master the roads to prepare for their future careers as professional truck drivers, we’re always extra grateful for the snow plow drivers and their commitment to the community—and for helping us to keep our business open and our students safe throughout the winter. What Do Snow Plow Drivers Do? Snow plow drivers begin preparing for the arrival of the winter season in October by checking their equipment, stocking materials, reevaluating routes, and training new recruits. Once the snow arrives, these knowledgeable men and women work around the clock, during the heaviest of snowstorms, and through freezing cold temperatures to make sure the city streets, freeways, highways, and residential areas are open and safe for travel. They’re trained experts with commercial driving licenses (CDL) that permit the use of heavy, state-of-the-art machinery to push thick blankets of snow, slush, and ice off of the streets. 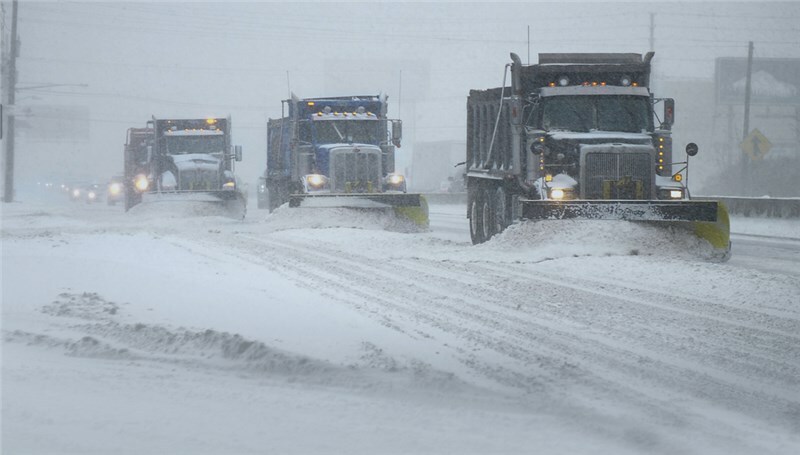 Snow plow operators often work long shifts of up to 12-hours, during massive storms and intense weather conditions. They also maintain communication with other crew members and supervisors from the Department of Transportation to effectively coordinate to keep all roads treated and open during severe weather. How Can I Help Snow Plow Drivers? Keep Your Distance:Remember that while snow plow drivers operate very large and powerful vehicles, their field of vision is very limited. They might not be able to see you if you drive too close to them, so remember not to tailgate, crowd, or come close to the snow plow machine when in operation. Drive Slowly and Give Them Space: Snow plows drive very slowly and need plenty of space to turn corners. Snow plows can even create large snow clouds that can be dangerous and reduce your visibility. If you find yourself driving near one, slow down and be patient. Give the vehicle the time and space it needs to do its job properly, keeping yourself and your vehicle safe at the same time. Keep Garbage Bins Off the Street: Snow plows need a clear path in order to properly sweep snow, slush, and ice off the streets and roads. Make sure you bring your trash bins in at the right times, and that they aren’t obstructing the roads at any time. Keep Cars in the Driveway: Don’t leave cars parked in the street, especially in areas where parking is not allowed. Thanks to our snow plow drivers, residents, commercial drivers, and our students at 160 Driving Academy are able to continue using the roads—even after massive snowstorms. Many of our students are inspired by their service, earning CDL licenses to gain employments snow plow drivers in cities across the nation. If you’ve thought about becoming a truck driver—or even a seasonal snow plow driver in the winter—160 Driving Academy can help you get you on the right track to a successful new career. To find out more information about 160 Driving Academy, CDL classes, and other details, give us a call now or fill out our online form to contact our team today.